Died 304 (?). According to the Roman Martyrology, Saint Emerentiana was the foster sister of Saint Agnes. While she was still a catechumen, Emerentiana was discovered by a pagan mob praying at the tomb of her recently martyred sister, and was stoned to death. There was, indeed, a real Roman martyr named Emerentiana, whose cultus is very ancient, as testified by its inclusion in the martyrologies of Jerome, Bede, and others, but not even the date of her death is known. She may have suffered with Saints Victor, Felix, and Alexander. It is claimed by Alban Butler that her relics were recovered with those of her sister in Christ near the Church of Saint Agnes on the Via Nomentana when it was being restored during the reign of Pope Paul V. Farmer reports that they were found nearby. Her connection with Saint Agnes ensured her popularity. Saint Emerentiana is pictured as a young maiden with a stone or being stoned by a mob at Saint Agnes’s tomb (Roeder). She is invoked against colic and stomach ache (Roeder). 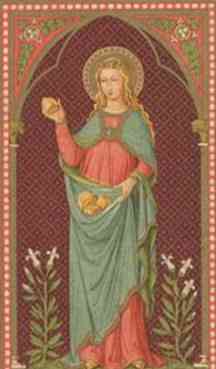 May blessed Emerentiana, Virgin and Martyr, who was ever pleasing to You by the merit of her chastity and by her trust in Your power, implore for us Your forgiveness, we beseech You, O Lord. Through Jesus Christ, thy Son our Lord, Who liveth and reigneth with thee, in the unity of the Holy Ghost, ever one God, world without end. R. Amen. Mercifully hear the prayers of thy Church, we beseech thee, O Lord, that all adversities and errors being overcome, she may serve thee in security and freedom. You love justice and hate wickedness. V.Therefore God, your God, has anointed you with the oil of gladness. Alleluia, alleluia. Ps 44:15-16 V. Behind her the virgins of her train are brought to the King. They are borne in to You with gladness. Alleluia. May the sacrament we have received, aid us, O Lord, and by the intercession of blessed Emerentiana, Your Virgin and Martyr, may it keep us forevermore under Your everlasting protection. Through Jesus Christ, thy Son our Lord, Who liveth and reigneth with thee, in the unity of the Holy Ghost, ever one God, world without end. May this Communion, O Lord, cleanse us from sin and, through the intercession of the Blessed Virgin Mary, Mother of God, make us sharers of Your heavenly healing.